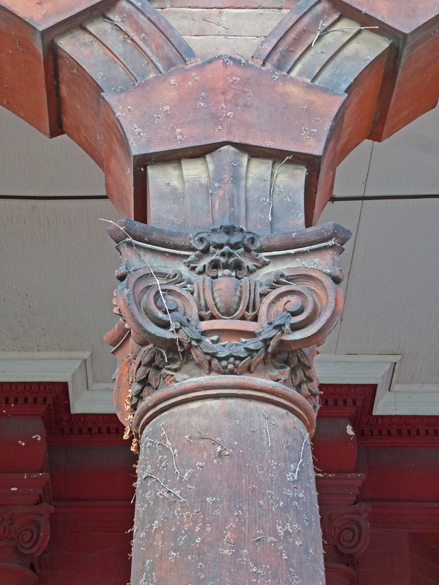 This is a pic of the carving found at the top of the columns of the porch in yesterday's pic. It is good to see that the details have survived the years so well and are now visible after a growth of vines has been removed. From an era when the outside decor of a building was artistic. Something that has been omitted in modern day structures. You have a wonderful eye for detail Pat. That is indeed a very nice carving and its great that it is still around today. That is such beautiful design detail. You just don't see that anymore. Hi Pat. Have just had a fab time looking back on missed posts. Absolutely love every one of your architectural posts. So glad they've removed the ivy from the building here, the details are far too good to be covered up, I'm sure the architect would agree ☺ Hope all is well with you in Toronto, I did think of you when I was taking the Gehry building shots, he is brilliant! And it was just done by people who were craftsman but didn't consider themselves as artists. Try that today. Good to have those vines removed because they can be very damaging to buildings. Happy to see that it appears not to be the case here. Love carvings even tho the face is a might fierce! Hello, what a cool carving and column. Great find. Happy weekend! Oh my yes, it's beautiful and I'd enjoy knowing what each detail stood for! Details like this are such a treat to come across.